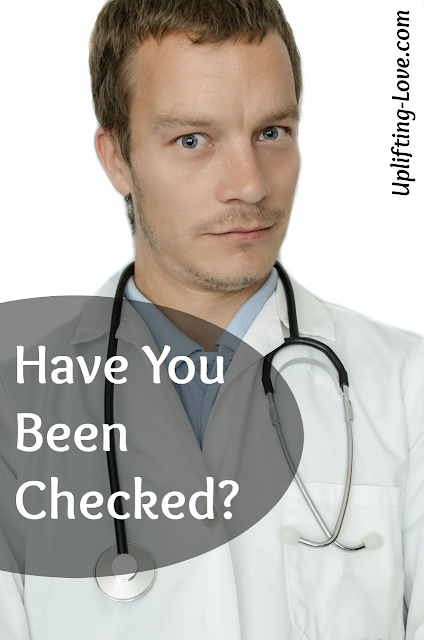 Uplifting Love: Have You Been Checked? I took today off of work. Ever since I came back to work after our newest little one was born I've thought to myself, at least twice a week, "it's lame that we have to work to get paid." I totally understand the support the concept and program but it's still pretty lame. It's like having your appendix taken out. Sometimes we just have to do it but no one enjoys it. This morning I went with Cami to her six week post-baby check up. She got the "green light" that everything's okay and she's all healed up. We can check her check-up off the checklist. Going to the doctor is always an adventure, but not a good one. There's a lot of waiting, a couple of minutes of talking, you feel embarrassed and weird, and at the end they tell you that you owe them a bunch of money for the privilege of allowing them to treat you like a nuisance. Anyway, I can really get off on a rant about the doctor's office Cami goes to. The doctors are great, the office isn't. Back to the story. We're in the exam room and the nurse handles Cami a stack of sheets and asks her to undress and cover up (as best she can) with these sheets and that the doctor will be in shortly. Twenty-five minutes later the doctor comes in, Cami has been loosely wrapped in sheets which I loved, but she is now chilly and uncomfortable, and gets the obligatory small talk out of the way and begins to examine Cami. Any woman who has had a baby becomes very used to being poked and prodded and having stranger's hands in and on the most private areas of their body. How they don't feel violated is beyond me. I am grateful for doctors and all that they know and do. Sometimes I just wonder if they perhaps forget that while they may be used to examining people's private areas for hours a day, the people being examined are NOT used to it. As we're leaving the doctor's office I am marveling at this wondrous woman holding my hand and walking beside me. All that she risks and goes through to bring our children into this world. Children are a miracle. The fact that they have mothers is the greater miracle. Go tell your mom thank you (and if you and your wife have children thank her too!). Did You Get Lucky Today?